Maintaining dependable partnerships is a vital component to the success of a business. Border States Electric’s (BSE) Supplier of the Year Awards recognize manufacturer partners that provide exceptional service and continue to show dedication and support to BSE and their customers. Regional Supplier of the Year recipients must meet all selection criteria, including developing localized marketing strategies with BSE branches, offering strong local support for sales calls, resolving issues or problems quickly, driving consistent growth and frequently helping the branches and all departments. The Above and Beyond Service Excellence Award is given to a supplier that has exhibited unprecedented support to BSE and its customers. It’s structured to distinguish the supplier for providing excellent service and recognizes their dedication to the mutual relationship. Milwaukee Tools was chosen for their best in class support of marketing programs, training and strong local representation. The Sales and Marketing Excellence Award is given to a manufacturer partner that actively participates in sales efforts and helps strengthen BSE’s customer base. Nominees are leaders in profitable sales growth, gross margin improvement and product and sales training. These suppliers excel in joint sales and marketing strategies, customer-focused marketing programs, innovative marketing promotions, market development funding and sales tools and materials. They provide catalog content and support industry initiatives, local branches and new business opportunities with a compelling spirit of partnership. In 2016, Legrand collaborated with BSE on a number of innovative marketing strategies and was a strong supporter of BSE’s sales and marketing initiatives. The Operational and Technological Excellence Award is presented to a supplier that provides innovative, state-of-the-art business practices and quality services. Those nominated for this award are a step ahead of the rest as evidenced by technology-driven logistics, services, inventory performance and communications. The recipient works collaboratively, emphasizing a true spirit of partnership. Pentair was chosen for continuing to maintain the highest status in BSE’s vendor performance management program. Pentair continues to drive transactional costs out of the supply channel by automating as many processes as possible with EDI and other innovative means. Regional Supplier Sales Representative or Agency awards are given to supplier sales agencies, agents and representatives that maintain dependable partnerships that go above and beyond to support BSE’s customers and employee-owners. 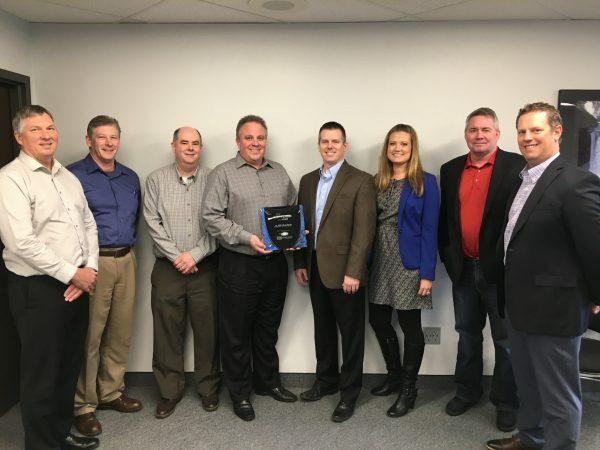 The NE Region management team presented AJB Sales with the NE Region Agency of the Year award at the AJB facility in Minneapolis, Minnesota. We were able to personally thank each individual for their partnership and hard work. BSE supplies products and services to construction, industrial and utility customers. The 100 percent employee-owned company is the eighth largest electrical distributor in the U.S. as ranked by Electrical Wholesaling magazine. BSE has more than 2,200 employees and 95 branches in 18 states. Corporate headquarters are located in Fargo, North Dakota.